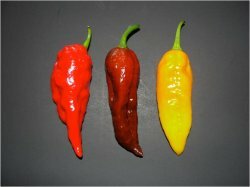 The Chocolate Bhut Jolokia is a natural brown variant of the Bhut Jolokia. It became available to the public in 2008 through a grower in Assam, India. It has the heat level of a Red Bhut Jolokia but also has a sweet undertone. One of the most delicious Superhot chiles I have ever tasted.